© 2003 Plant Management Network. Accepted for publication 4 March 2003. Published 25 March 2003. Wrather, J. A., Koenning, S. R., and Anderson, T. R. 2003. Effect of diseases on soybean yields in the United States and Ontario (1999-2002). Online. Plant Health Progress doi:10.1094/PHP-2003-0325-01-RV. High yields are critical to soybean producer profit margins, especially during periods of low prices for soybean. Soybean yields in the United States and Ontario have been suppressed by diseases in the past (8). Consequently, income derived from this crop is less than optimal. This financial loss is important to rural economies and to the economies of allied industries in urban areas. Research must focus on management of diseases that cause extensive losses, especially when funds for research are limited. Clearly, knowledge of the losses caused by various soybean diseases is essential when prioritizing research budgets. The Southern Soybean Disease Workers (SSDW) began reporting estimated soybean losses due to diseases in the southern United States in 1974, and a summary of these data from 1974 to 1994 has been published (6). Estimates of soybean yield losses due to diseases for the United States from 1996 to 1998 have been published (7). The objective of this project was to compile estimates of soybean yield losses due to diseases for each soybean producing state in the U.S. and Ontario from 1999 to 2002. The goal was to provide this information to help funding agencies and scientists prioritize research objectives and budgets. This report was prepared through a joint effort of North Central Regional Committee on soybean pathology (NCR-137) and the Southern Soybean Disease Workers. One objective of these two groups is to monitor and publicize the development of new or recurring diseases of soybean in North America. Individuals from each soybean-producing state in the US and the Province of Ontario were asked to estimate the percent of yield loss that each soybean disease caused in their state or province during 1999 to 2002. Dr. A. Tenuta and Dr. T. Anderson provided the estimates for Ontario, and those that provided estimates by state are listed in Table 1. These scientists developed their estimates from field surveys, research plot data, and questionnaires to field workers and extension staff. Most individuals used several of these methods and consulted with their colleagues to develop a percent loss estimate. The estimates of yield losses in Iowa due to soybean cyst nematode (SCN) (Heterodera glycines Ichinohe) for 1999 to 2002 were based on the following assumptions and conditions. First, 74% of Iowa crop land was infested with SCN (5) at a population density of 4,340 eggs per 100 cc of soil or greater. Second, 35% of Iowa farmers grew maturity group I soybean cultivars, 35% grew maturity group II, and 30% grew maturity group III. Third, 95% of Iowa farmers grew SCN-susceptible cultivars, and 5% grew SCN-resistant cultivars. Fourth, yield loss with SCN-susceptible varieties was 33.9%, and yield loss for SCN-resistant cultivars was 21.5% (4). Fifth, results of cultivar trials in SCN-infested and noninfested fields were representative of results that would be obtained throughout Iowa. Production losses for all areas were based on estimates of yield in the absence of disease. yield suppression due to diseases by state. During 1999, 67 million metric tons (t) of soybean were produced in the United States from 29.3 million ha, 70 million t were produced from 29.4 million ha in 2000, 73 million t were produced from 29.5 million ha in 2001, and 68.3 million t were produced from 29.0 million ha in 2002. Ontario farmers produced 2 million t of soybean from 850,000 ha in 1999, 2 million t of soybean from 890,000 ha in 2000, 1 million t from 850,000 ha in 2001, 1.8 million t from 835,000 ha in 2002. Disease reduced soybean production in the United States and Ontario in 1999 to 2002 (Appendix, Tables 2-9). Losses to individual diseases varied among regions in the United States. The total soybean yield losses to diseases in the United States and Ontario varied among years (Appendix, Tables 10 and 11). 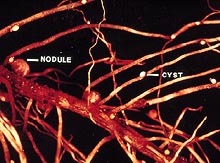 Soybean cyst nematode (Figs. 1 and 2) caused more estimated total losses to soybean in Ontario during 1999 to 2002 than any other disease, and it was followed in order by seedling diseases, Phytophthora root and stem rot (Fig. 3) [Phytophthora sojae (Kaufman & Gerdemann)], and Sclerotinia stem rot (Fig. 4) [Sclerotinia sclerotiorum (Lib.) de Bary] (Appendix, Table 10). 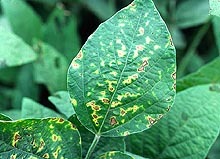 In the United States, SCN caused more estimated losses to soybean during 1999 to 2002 than any other disease, and it was followed in declining order by Phytophthora root and stem rot, sudden death syndrome (Fig. 5) [Fusarium solani f. sp. glycines (Roy)], and charcoal rot (Figs. 6 and 7) [Macrophomina phaseolina (Tassi) Goidanich] (Appendix, Table 11). Fig. 1. This crop shows SCN damage. Fig. 2. White females of Heterodera glycines on a soybean root. Fig. 3. 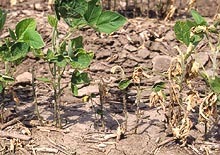 Soybean plants killed by Phytophthora root and stem rot. Fig. 4. 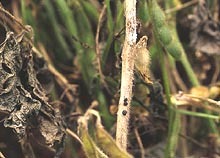 Bleached soybean stems due to Sclerotinia stem rot. Fig. 5. Foliar symptoms of sudden death syndrome. Fig. 6. Premature defoliation caused by charcoal root rot. Fig. 7. Sclerotia of Macrophomina phaseolina in soybean stem tissue. Losses to SCN declined slightly in the United States from 4.2 million t in 1999 to 3.6 million t in 2002. These losses are lower than those reported for 1998 (7.6 million t) (8). The declines from 1998 to 2002 were possibly due to greater farmer awareness of SCN through the efforts of the Soybean Cyst Nematode Coalition in the north central states and increased planting of resistant cultivars in infested fields. The yield suppression due to SCN in the United States during 2002 was valued at $783.8 million ($216/t). 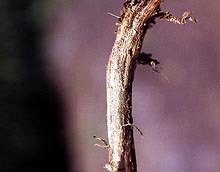 Phytophthora root and stem rot caused losses of soybean in most regions in the United States and in Ontario from 1999 to 2002. The estimated yield losses in the United States due to this disease did increase from 0.7 million t in 1999 to 1.2 million t in 2002. This increase only occurred in northern regions of the United States and may be caused by the changes in virulence of Phytophthora isolates from this area (1). The yield suppression due to this disease in the United States during 2002 was valued at $252.1 million ($216/t). Losses caused by Sclerotinia stem rot (SSR) were greater in Ontario during 2000 than 1999, 2001, and 2002 and were greater in the United States for 2000 than 1999, 2001, and 2002. This disease has been a problem only for North Dakota, South Dakota, Wisconsin, Iowa, Illinois, Minnesota, and Indiana. Declines in the losses due to this disease in the United States from 1997 (957,000 t) (8) to 2002 (74,108 t) were possibly due to increased planting of less susceptible cultivars, changes in management practices and/or changes in weather patterns. Losses to charcoal rot in the United States declined from 1999 to 2002, and they also declined in Ontario during these years. The reasons for these declines are not clear. Because resistant cultivars are not available for planting, these declines must, in part, be due to changing weather patterns. The yield suppression due to charcoal rot in the United States during 2002 was valued at $173.8 million ($216/t). 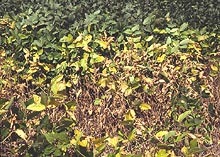 Sudden death syndrome (SDS) yield losses occurred primarily in Arkansas, Iowa, Illinois, Indiana, Kentucky, Missouri, and Tennessee during 1999 to 2002. Losses to this disease were especially severe in Iowa, Illinois, and Indiana. Scherm and Yang (3) determined that weather patterns were more conducive for this disease for the central than any other area of the United States, and our data confirm their observation. The yield suppression due to SDS in the United States during 2002 was valued at $157.4 million. Reliable estimates of crop losses to diseases based on precise methodology using crop surveys and crop loss models have been very useful for defining the severity of various diseases (2). It is hoped that estimates of soybean yield losses to diseases based on precise methodology will be available in the future. Plant diseases reduced soybean yield in North America from 1999 to 2002. Yield losses may have been worse if not for the use of disease management strategies and systems in most states. To reduce disease losses, university research and extension efforts must be expanded to provide more effective preventive and therapeutic disease management strategies and systems to producers. This work was supported, in part, by the Missouri Agricultural Experiment Station. This work was also supported by the U.S. Soybean Farmer Checkoff through the United Soybean Board, USDA Grant 00-34113-8968, and the Ontario Soybean Growers. The authors thank Joyce Elrod for her efforts in this project. 1. Abney, T. S., Melgar, J. C., Richards, T. L., Scott, D. H., Grogan, J., and Young, J. 1997. New races of Phytophthora sojae with Rps 1-d virulence. Plant Dis. 81:653-655. 2. James, W. C., Teng, P. S., Nutter, F. W. 1991. Estimated losses of crops from plant pathogens. Pages 15-51 in: CRC Handbook of Pest Management. CRC Press, Boca Raton, FL. 3. Scherm, H., and Yang, X. B. 1999. Risk assessment of sudden death syndrome of soybean in the north-central United States. Agric. Sys. 59:301-310. 4. Tylka, G. L., and Souhrada, S. K. 1999. Evaluation of soybean varieties resistant to soybean cyst nematode in Iowa-1998. Iowa State University Coop. Ext. Serv. Publ. No. IPM-52. 5. Workneh, F., Tylka, G. L., Yang, X. B, Faghihni, J., and Ferris, J. M. 1999. Assessment of soybean brown stem rot, Phytophthora sojae, and Heterodera glycines in the north central United States using area-frame sampling: prevalence and effects of tillage. Phytopathology 89:204-211. 6. Wrather, J. A., Chambers, A. Y., Fox, J. A., Moore, W. F., and Sciumbato, G. L. 1995. Soybean disease loss estimates for the southern United States, 1974 to 1994. Plant Dis. 79:1076-1079. 7. Wrather, J. A., Stienstra, W. C., and Koenning, S. R. 2001. Soybean disease loss estimates for the United States from 1996 to 1998. Can. J. Plant Pathol. 23:122-131. 8. Wrather, J. A., Anderson, T. R., Arsyad, D. M., Tan, Y., Ploper, L. D., Porta-Puglia, A., Ram, H. H., and Yorinori, J. T. 2001. Soybean disease loss estimates for the top 10 soybean producing countries in 1998. Can. J. Plant Pathol. 23:115-121. Table 2 (Part I). Estimated reduction of soybean yields in metric tons due to diseases for 15 southern states during 1999a. a Rounding errors may occur; Tr = trace. b Other diseases were: red crown rot caused by Cylindrocladium parasiticum in NC, GA, and VA; target spot in LA; and Phymatotrichum root rot in TX. c Other nematodes were: stubby root in VA; Columbia lance in NC and GA; lance in LA; and Reniform in AL, AR, and NC. Table 2 (Part II). Estimated reduction of soybean yields in metric tons due to diseases for 15 southern states during 1999a. Table 3 (Part I). Estimated reduction of soybean yields in metric tons due to diseases for 13 northern states and Ontario during 1999a. a Rounding errors may occur; Tr = trace. Data from MN were not available. b Other diseases were: Rhizoctonia root and stem rot in WI and Ontario, and green stem in IL. Table 3 (Part II). Estimated reduction of soybean yields in metric tons due to diseases for 13 northern states and Ontario during 1999a. Table 4 (Part I). Estimated reduction of soybean yields in metric tons due to diseases for 15 southern states during 2000a. a Rounding errors may occur. b Other diseases were: red crown rot caused by Cylindrocladium parasiticum in NC and GA; ozone in NC; green bean syndrome in AR and LA; target spot in LA; and Phymatotrichum root rot in TX. c Other nematodes were: stubby root in VA; Columbia lance in NC and GA; lance in LA; lesion in AL; and Reniform in AL, AR, and NC. Table 4 (Part II). Estimated reduction of soybean yields in metric tons due to diseases for 15 southern states during 2000a. Table 5 (Part I). Estimated reduction of soybean yields in metric tons due to diseases for 13 northern states and Ontario during 2000a. a Rounding errors may occur: Tr = trace. Losses in MN were not available. b Other diseases were: Rhizoctonia root and stem rot in WI, and Alternaria leaf spot in KS. Table 5 (Part II). Estimated reduction of soybean yields in metric tons due to diseases for 13 northern states and Ontario during 2000a. a Rounding errors may occur; Tr = trace. Losses in MN were not available. Table 6 (Part I). Estimated reduction of soybean yields in metric tons due to diseases for 15 southern states during 2001a. b Other diseases were: ozone in NC; red crown rot caused by Cylindrocladium parasiticum in NC, SC and VA; and green stem in AR. Table 6 (Part II). Estimated reduction of soybean yields in metric tons due to diseases for 15 southern states during 2001a. b Other diseases were: ozone in NC; red crown rot caused by Cylindrocladium parasiticum in NC; SC and VA; and green stem in AR. Table 7 (Part I). Estimated reduction of soybean yields in metric tons due to diseases for 13 northern states and Ontario during 2001a. b Other diseases were: Rhizoctonia root and stem rot in WI. Table 7 (Part II). Estimated reduction of soybean yields in metric tons due to diseases for 13 northern states and Ontario during 2001a. Table 8 (Part I). Estimated reduction of soybean yields in metric tons due to diseases for 15 southern states during 2002a. a Rounding errors may occur; losses in FL were not available. 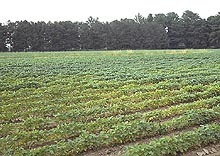 b Other diseases were: red crown rot caused by Cylindrocladium parasiticum in NC, GA, and VA;, ozone in NC; green bean syndrome in AR and LA; target spot in LA; and Phymatotrichum root rot in TX. Table 8 (Part II). Estimated reduction of soybean yields in metric tons due to diseases for 15 southern states during 2002a. a Rounding errors may occur, losses in FL were not available. Table 9 (Part I). Estimated reduction of soybean yields in metric tons due to diseases for 13 northern states during 2002a. Table 9 (Part II). Estimated reduction of soybean yields in metric tons due to diseases for 13 northern states during 2002a. due to diseases during 1999, 2000, 2001 and 2002. Table 11. Estimated reduction of US soybean yields in metric tons due to diseases during 1999, 2000, 2001, and 2002.